At Axis Technolabs, PHP ecommerce website development company in USA & India. We have 20+ well trained and experienced developers team for PHP development. We are working on php web application development since last 6 years in USA. 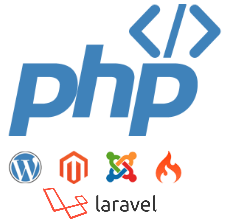 We have highly qualified, experienced and certified PHP developers who build dynamic websites, web applications, web services, php website design, CMS application development, ecommerce applications, php application development, responsive or mobile friendly php website designs and many more customize php web application. our expert developers always here to hire on hourly php, monthly and project based as per your custom requirement. Our Php Developers. AxisTechnoLabs contribution to PHP Open Source are advanced over years in response to growing demands from global clients.Our team has proven that this new development paradigm can produce output of considerable quality & quantity, which has led to massive business interest from our many clients. AxisTechnoLabs offers complete PHP development services and web programming services. We develop custom PHP web application, portals, ecommerce solution, business processes using PHP, MySql, MVC framework, Open Source Ecommerce and open source CMS like wordpress, joomla, drupal, magento, osCommerce and X-cart in India, US. Hire dedicated PHP developer / programmer from AxisTechnoLabs. Our expertise at creating web applications using open source technology. hire dedicated PHP developers Call on our expert team for PHP development, Iphone and Mobile development. Fill out the form on the right, give us a call at +91-9825950990 or contact us today to receive your free consultation. PHP development company in USA provides you best solutions for your business needs.